Only a profound misunderstanding of the nature of the Iranian regime could lead anyone to believe that the proposed P5+1 deal will end or satisfy Tehran's nuclear ambitions. The U.S. is capable of bringing Iran's nuclear program to a halt. Unfortunately, the U.S. has simply chosen not to do so. Israel will now have to decide whether to acquiesce in Iran's nuclear drive or prepare to confront it. The nuclear framework agreement signed between Iran and world powers, namely the United States, Russia, China, Britain, France and Germany, on April 2, was defined by U.S. President Barack Obama as an "historic understanding," while Prime Minister Benjamin Netanyahu defined the deal as "bad." Both leaders are right: The deal has radically changed Iran's position in the global theater in exchange for Iran temporarily slowing down its pursuit of nuclear weapons, and in this respect it is indeed "historic." However, the agreement affords Iran the status of a regional power and legitimizes it as a nuclear threshold state. It is now up to Iran to decide when to cross this threshold, and in this respect it is a "bad" deal. The U.S. changed its policy mid-negotiations, at first demanding that Iran be stripped of its nuclear weapons production capabilities but later agreeing only to place limitations and supervision on these capabilities. The framework deal clearly indicates that the U.S. has come to accept that Iran will one day possess military nuclear capabilities, and that at the end of the supervision period there would be nothing stopping the Islamic Republic from realizing this potential. Obama told the American people as much in a radio interview, before his spokesmen rushed to say he was misunderstood. But even if that was the case, Obama's statements reflected the reality which may arise from any final agreement with Iran. This reality entails three scenarios. The first may see the Iranians relinquish their nuclear efforts, willingly or otherwise. Some in the U.S. administration believe this is a viable option, and that bolstering the moderate forces within Iran will eventually effect change. The second scenario may see the Iranians diligently follow the agreement, while stabilizing their economy, reinforcing their regional status, strengthening their allies, such as Hezbollah, and enhancing their nuclear expertise. Then, once the agreement's sunset clause comes into effect, the Iranians will resume the military aspects of their program with renewed zeal. Throughout the negotiations, that U.S. has attempted to prolong the period during which Iran would be unable to pursue nuclear capabilities, saying that if Tehran complies with the agreement, it would buy the West more time, at least a decade. The administration's excuse was that a deferral of the matter was preferable to the alternative, a military operation, which may not buy the West the same amount of time, making the deal a better option. The third scenario may see the Iranians bide their time and wait for the right moment to violate the deal. This will probably happen only after all the sanctions are lifted, and after enough countries have vested financial interests in Iran, which would deter them from targeting its economy. The U.S., for its part, has pledged to put in place rigorous inspection practices, which would guarantee the West at least a year to detect any violation of the agreement. 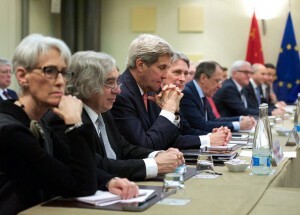 Would such an agreement guarantee, to any extent, a change in Iran's nuclear aspirations? It seems the opposite is true. In the near future, the agreement will only fuel Iran's desire to realize the potential outlined and legitimized by the deal. The hope that the agreement will somehow breed a positive process in Iran has no hold in reality. Iranian President Hassan Rouhani appears eager for his country to obtain nuclear weapons. In fact, there is no debate within the Iranian leadership on whether or not such capabilities are necessary, only about the best way to go about achieving them. Only a profound misunderstanding of the nature of the Iranian regime could lead anyone to believe that this or any deal will somehow satisfy the ayatollahs' nuclear ambitions, to the point of becoming a game changer. Is there really no military alternative that could result in a longer setback to Tehran's nuclear program, one that could outweigh the delay outlined in the current deal? After all, it was under orders from Obama that the U.S. developed a weapon that could seriously compromise Iran's nuclear facilities. The argument that any military strike would result in only a short-term setback in Iran's nuclear endeavors is wrong, because the seemingly professional American calculation on the matter is purely technical. This calculation is flawed because it fails to account for the effect a successful strike would have on Tehran's willingness to invest in rehabilitating a program that could be destroyed in a matter of several nights, which is how long the U.S. said it would take to strike all of Iran's nuclear facilities. I believe that Iran, subject to crippling sanctions, would not rush to resuscitate its nuclear program in the event it was destroyed by the U.S. It also stands to reason that Iran's actual ability to retaliate over such a strike, other than by putting Hezbollah in play, would be limited. An American strike could buy the West more than just a few years, but its reluctance to assume the risks involved in a military operation is understandable. Regardless, the reality is clear: The U.S. can forcibly bring the Iranian nuclear program to a halt; it simply chooses not to do so. The argument that the framework agreement would afford the West sufficient time to detect any violation is also unfounded. The Iranians are not stupid. They have no intention of blatantly violating major understandings, and their pursuit of a nuclear weapon will simply slow to a somewhat vague crawl. Post-deal intelligence on the Iranian program will not be as accurate, as the U.S. stands to impose restrictions on intelligence gathering across the Islamic republic, which will no longer be an enemy state, but rather a nation with which Washington seeks to improve relations. When ambiguous intelligence eventually does surface, no one will rush to declare the deal has failed. On the contrary, until such time as clear-cut intelligence mandates an American response, the majority of the year-long retaliation window will have elapsed. Reinstating international sanctions at that time would be nearly impossible, becoming all the more reason to avoid a military strike. The goals set by the U.S. for that year-long window  detecting any violations and retaliating, either via sanctions or a military strike  will fail the test of reality. The Iranians are too smart to make a mistake of that caliber. Iran has been fooling the world for 20 years, and the deal will make it that much easier, as it would be easier for the West to believe Tehran's lies than to admit it made a historic mistake and mount a military operation. Furthermore, the agreement stands to have serious geopolitical repercussions. The deal with Iran is likely to lead to a nuclear arms race in the Sunni Middle East, as well as to increased belligerency from Iran and its allies, such as Hezbollah, the Houthis, Syrian President Bashar Assad and Hamas. In the long run, the deal could potentially compromise what little stability is left in the region, which in turn would lend the Shiite-Sunni struggle new and terrifying dimensions, making an already violent theater even more volatile. Iran will try to capitalize on the regional superiority the U.S. has afforded it the first chance it gets, knowing American statements suggesting all options are on the table are nothing but hollow rhetoric. The most important American achievement in the framework deal was Iran's agreement to remove all the enriched material it currently has, or plans to produce, excluding a symbolic amount of enriched uranium. It is important to ascertain this commitment and to see it through. According to the American concept, the difference between Iran's considerable enrichment capabilities, which will remain intact, and the amount of enriched material it actually retains is a key factor in the agreement. However, in the long run, it is the number of operational centrifuges that matters  not the amount of enriched material removed from Iran. Given the deal's sunset clause, Iran's centrifuges would allow it to resume rapid enrichment activities as soon as it seeks them. The fact that Iran has agreed to cease plutonium enrichment is trivial. The Arak reactor is not fully operational, so it was easy for the Iranians to relinquish something they never had. The concept of time is a fundamental bone of contention between the U.S. and Israel and other countries in the region. A decade may seem like a long time for leaders who are elected for a limited period of time, but for leaders with historical perspectives of national security, 10 years is no time at all. The final deal brewing between the Islamic republic and the West will afford Iran the conveniences of honing its nuclear expertise, giving it the ability to produce weapons within a decade. The Iranians understand this deal will buy them time, and their price is the future recognition of Iran as a nuclear power. That is an impossible price for Israel and other nations in the Middle East to pay. The most viable alternative should have been to continue imposing and aggravating the sanctions, while making it clear to Iran that any nuclear endeavor on its part would be limited by clear, bold, red lines, and if any of them are ever crossed, the U.S. will react forcefully. Exhausted by current sanctions, Tehran would be wary of violating the deal. This could have made Iran relinquish its nuclear program, especially faced with a viable military threat, but given the American policy, which no longer seems to want to strip Iran of its nuclear capabilities, other concepts must be introduced. Should the outline of the framework agreement mature into a final deal, Israel will be faced with only a handful of options: Living with the deal, meaning preparation for the day when Iran becomes nuclear while trying to generate deterrence. Or Israel can attempt to forcibly stop Tehran, contrary to the wishes of other world powers. Neither option is a good one, making for a very tough call. Maj. Gen. (res.) Yaacov Amidror is the Greg and Anne Rosshandler Senior Fellow at the Begin-Sadat Center for Strategic Studies. Maj. Gen. (res.) Yaacov Amidror is Anne and Greg Rosshandler was Senior Fellow Former National Security Advisor to the Prime Minister of Israel and the Head of the National Security Council. He served 36 years in senior IDF posts, including commander of the Military Colleges, military secretary to the Minister of Defense, director of the Intelligence Analysis Division in Military Intelligence, and chief intelligence officer of the Northern Command. He is author of three books on intelligence and military strategy. http://besacenter.org/perspectives-papers/strategic-folly-in-the-framework-agreement-with-iran/. A version of this article was published on April 17, 2015 in Israel Hayom.